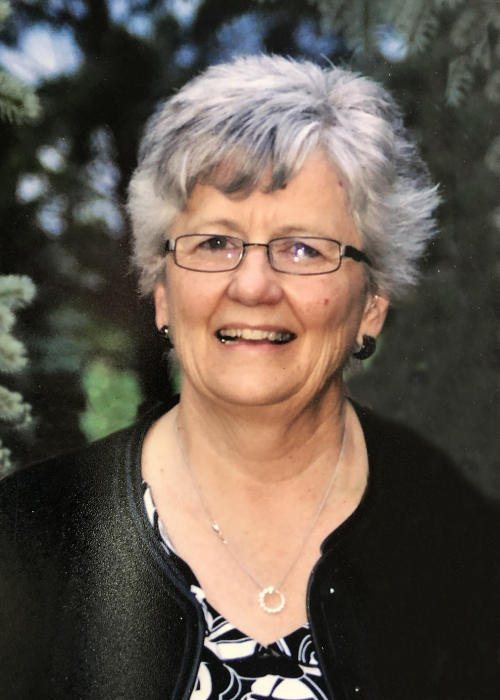 Peacefully with her family at her side, Patricia Leslie passed away on Monday February 4, 2019 at Portage General Hospital at age of 80 years old. Pat will be lovingly remembered by daughters Lori Tully, Deanne (Dale) McLeod, Karen (Kirk) Halwas; grandchildren Nicole (Steve) Chychota, Allyssa (Mark) Sollner, Heather (Dan) McLeod, Megan Tully, Kendra, Calista, Carter and Kale Halwas; great granddaughters Dawn and Danielle Desjardins and Ava Sollner; siblings Bob Holliday and Jean McIvor; nieces and nephews Tammy and Tracey McIvor as well as Trudy, Todd and David Holliday; and many special friends. She was predeceased by her loving husband Donn Wayne Leslie; parents Dawson and May Holliday and son-in-law Barrie Tully. Pat was born at home on the farm near Oakville Manitoba. She lived and worked on her family farm and attended school at Oakville Manitoba. Pat enjoyed many careers, working for Great West Life in Winnipeg, Portage Mutual, 4H Program Assistant, sold aerial photos and encyclopedias. Her final career and greatest passion was the Oakville Flower Shop. She married Donn Leslie June 27, 1959 in the Oakville United Church. They moved to the family farm where they farmed and raised their three daughters. She is remembered as a happy, kind and generous person. Her creativity was enjoyed by many friends, neighbours and customers over the years. Pat was a woman with immense class in all situations. Pat enjoyed a number of pastimes such as gardening, watching curling, scrapbooking, travelling and eating out. However, she most enjoyed being with her family. Volunteering in the community was very important to Pat. She was involved with many clubs such as Oakville Skating Club, Oakville 4H, the Skidoo Club, Chamber of Commerce, and the Oakville Cemetery board. Viewing and visitation will be held at McKenzies Portage Funeral Chapel on Friday February 8, 2019 from 7 to 8 pm. Memorial Service and Celebration of Pat’s Life will be held at Oakville Community Hall on Saturday February 9, 2019 at 11 am, led by Shirley McLaren. Private interment will take place at the Oakville Cemetery. As expressions of sympathy, if friends so will, donations may be made in Pat’s memory to Sunset Pallitive Care - Box 92, Portage la Prairie, MB, R1N 3B2 or Oakville New Hall/Daycare Fund - Box 32 Oakville, MB R0H 0Y0.